Boiled fish is a dietary product, easily assimilated by the human body. It is a source of valuable animal protein, vitamins and minerals. But we should not think that like any dietary product, boiled fish has no pronounced taste. Otvarivaya fish, we can get not only delicious broth – based fish soup or fish soup, but also a great second dish with sauce and your side dish can decorate any dinner. Boil any fish, but keep in mind that such species of fish as carp, carp, bream, crucian carp, smelt, and saffron cod or dried fish tastes better fried or dried form. If you are designed for cooking fish of different species and sizes, clean and sort it. In that case, if you have different size instances and along with the big fish a and fish a trifle, not worth the bother cleaning it. In this case, you will be able to make a double fish stock, cook in the "first water" it is a trifle. Gut small fish, put it in a pan. Large and medium fish , peel, separate the heads, fins and tails, wash and put them in the same pot. Pour small fish and head with fins with water and bring to a boil. As soon as the water boils, remove the foam, reduce the heat, to avoid obvious signs of boiling. Let it cook gently for a fish broth with half an hour, then strain it. The remaining fish bones and scales press through the cheesecloth into the broth, discard everything else and put the broth on the stove. Large fish cut into portions, small Express small carcasses. Clean the carrot, onion, parsley root. Onions finely cut, carrots and parsley root, small cubes. Put them in boiling broth or water, if you are not separately cooked small fish. Boil the broth with the vegetables for 5-7 minutes, then add 1 tablespoon of 3% vinegar or the juice of half a lemon, black pepper, salt and Bay leaf. Behind them lay the fish. The broth should cover it completely. Remove the foam, turn the heat to low and simmer the fish for 20 minutes. Remove the pan from the fire, pour into it the chopped greens, cover, and let sit for another 15-20 minutes. After that, boiled fish can be served on the table. As a side dish is perfect with boiled potatoes, vegetables – tomatoes, cucumbers, green peas, boiled cauliflower. 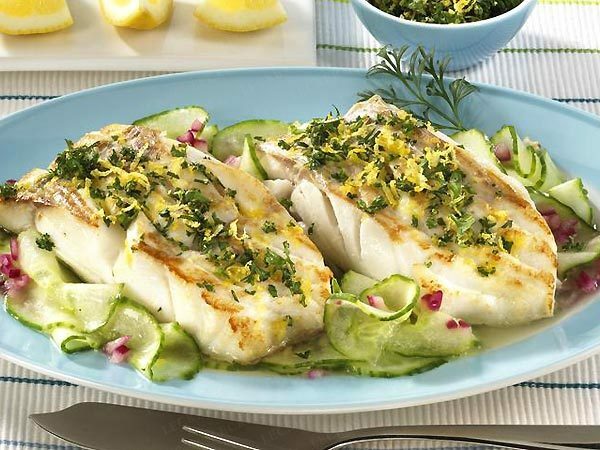 Can make special sauces for boiled fish – Polish, Dutch, white or tomato.